In the first opt-in form clinic post, we got a very lively reaction and over 30 user submissions for this follow-up post. After the difficult task of selecting just a few of those, we're now ready to have another look at real examples of opt-in forms and what steps you can take to improve them. Be warned: in this post, we're going deeper into the topic than before and if you invest the time into reading it, you'll know far more about how to turn your visitors into email subscribers than most people ever will. This is the lead-capture form from the sidebar on Videos for Shy People, a blog about video creation and video marketing. What I really like about this form is that it has a bold, yet simple style. It’s instantly eye-catching, but it neatly fits in with the overall design of the site. Alignment and placement of the elements in the form could be improved. There are three lines of text, separating the input fields from the submit button. This text should be moved up to sit between the headline and the fields, instead. Also, I personally like to display the field labels inside the fields themselves. This makes for a cleaner look, since the fields aren’t off-set to one side. These are cosmetic improvements that probably won’t dramatically boost conversions, but it never hurts to have a clean, professional look on your site. It’s very small and easy to miss. The button can and should be an eye-catching element in the form. The button text (often a crucial conversion element) is bland and it’s essentially a command: “submit!” That’s not very attractive. Add a benefit statement to the button, to make it friendlier (and get more signups). Finally, there’s the benefit statement. The headline is good as it is (love the font! ), but the benefit statement is quite shallow. 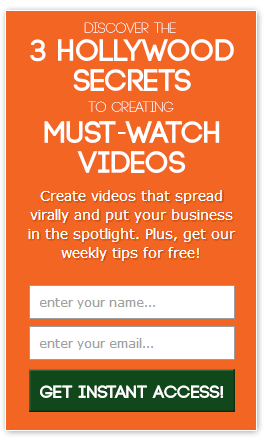 Yes, people in this niche probably want to know how to make must-watch videos, but why do they want to know that? There’s a deeper benefit in there, somewhere. And addressing such a deeper benefit can often lead to better conversions. I added an extra benefit statement in the body text and “re-chunked” the headline, to make it look less like a wall of text. I couldn’t find the original font, unfortunately. The one I picked is close, but not quite as good, so that’s a change I don’t recommend copying. 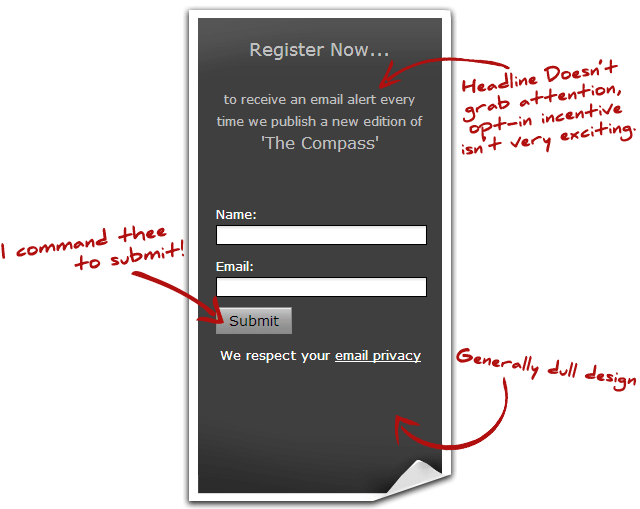 This is the sidebar opt-in form on the Compass Coaching site by Andy. This is an example of a form where I’d test a radically different version, or even several versions, as I think it can be fundamentally improved. Let’s tackle the easiest one first: once again, we have a boring, grey button that commands us to submit! This is probably the most common mistake made in online forms in general and I’ve already detailed how it can be fixed, in the example above. Overall, the design is a bit dull and the dark color doesn’t set the form apart from the rest of the site in a positive manner. As a go-to strategy, I usually choose the main color of the opt-in form to be a complementary color to the rest of the site. You can find complementary and matching colors using this free Color Scheme Designer. Probably the most important aspect of this form is the offer itself. The headline of “Register now…” doesn’t grab attention and it doesn’t make an attractive promise, either. The offer of being notified (some uncertain time in the future) about a magazine release also fails to excite (unless I’m already a fan of said magazine). Re-purposing an asset you already have can be a great way to create an opt-in incentive. An example of this can be found on Tropical MBA, where the incentive includes the first 50 podcast episodes in downloadable format. Although I have to add that I’ve found that smaller products tend to do better, as giveaways, so I’d make that less than 50 episodes. I added an eye-catching image and changed the copy to be a lot more benefit-oriented. Also note that I simply nabbed the image and much of the copy from the magazine itself. A final thing to consider is the placement of the form: a sidebar opt-in form will never deliver very high conversions, no matter how it’s designed. Take the same design and concepts and turn them into a lightbox or slide-in form and you’ll easily see a 5x increase in conversions. 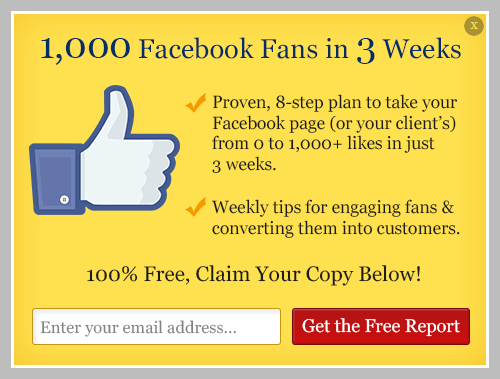 FanBoom is an app for building Facebook fan pages with all sorts of marketing features. The opt-in form above is one that appears as a slide-in when you scroll down on a blog post. I like the fact that it’s a dynamic form and I like the overall design: the yellow color is eye-catching and the button isn’t hidden in the background, either. Having said that, the “Sign Up!” command on the button could be improved and the alignment of the field and the button seems a bit odd. There’s a lot of room for improvement in the headline and copy on the form, as well. I’ve said it before and I’ll say it again: it’s better to use “Sign up for our newsletter” than not having an opt-in form at all, but it’s one of the weakest of all opt-in incentives. What this form needs, above all else, is a better offer. How do we come up with a better offer? Alternatively, we could go through the analytics of the blog and look at factors such as number of visits, time on site, bounce rate, number of comments and number of social shares to determine the hottest topics. The important point is that we find something that resonates with our target audience and create an offer based on that. Keep in mind that it’s also well worth testing several offers, to see which one converts best. 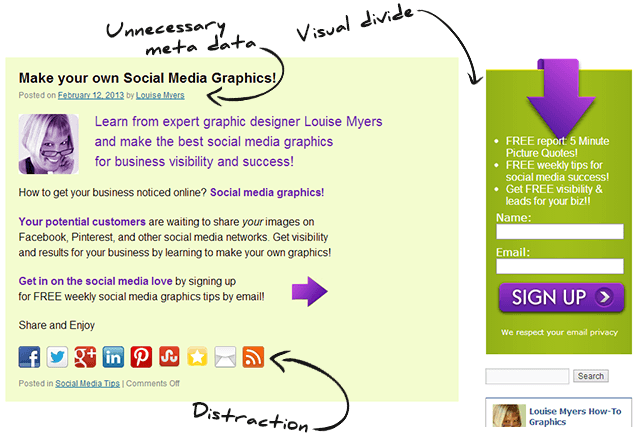 This is the main opt-in form on Lousie’s How-To Social Media Graphics website. What I like about the form are the bold colors, which stand out, but also match the site’s style quite well. The keen eye does notice that the form is probably a template, since the colors don’t match exactly, but that’s a minor detail. The biggest issue with the form is that the body text is quite under-emphasized: the small print almost seems a bit lost in the graphic-heavy surroundings. In addition, there are three features advertised, but none of them very convincingly. I recommend focusing on just one feature and advertising that more heavily. Provide “deeper benefits” as described in the first example. Also, it never hurts to add some sort of proof to your claims. Even if you just mention that what you’re giving away is a case study, that adds some implied proof. In the treatment, we’ve kept the bold colors and the arrow graphic element. We’ve also added a picture quote which, in this case, really is worth 1,000 words. It visualizes and explains what the offer is about and also delivers implied proof (there’s a custom image quote, so I probably know how to make one and hence, can teach you how to make one). At the same time, the picture allows us to add a benefit statement. There’s what appears to be a sticky post, which advertises the opt-in. The opt-in form, however, is in the sidebar and there’s a visual divide between the two. Louise has done a good job of somewhat bridging that gap with the inclusion of the arrows, but it’s far from ideal. In addition there’s post meta data below the title and there are social media buttons that do nothing but distract from the main conversion goal. I bet the conversion rate could be improved if the whole area was one cohesive unit, spanning the entire page width (i.e. no sidebar). How can that be implemented? Depending on the theme used, that’s something I’d struggle with as well, to be honest. Solution: create a mock-up of what you want it to look like and head to oDesk or Elance, where you’ll easily find someone who can implement the change on your site for a very reasonable price. 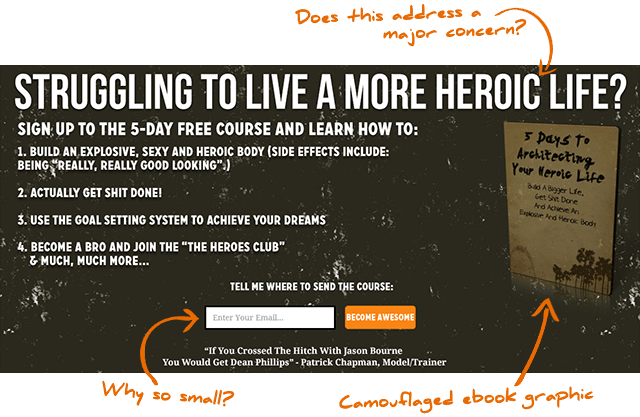 Dean’s Hero in Training website has a large area on the homepage dedicated to lead generation. That’s awesome. The opt-in form is already quite well done. What I like best about it is that it instantly conveys personality. There are no empty buzzwords here and you get the impression that the message is coming from someone who cares more about being authentic than about fitting in with the masses. That’s excellent and very well in tune with the site’s overall message. A headline on any page, in any situation, tends to be a high-leverage element: get it wrong and people will leave instantly. Get it right and it can boost the effectiveness of the entire page. In this case, I wonder whether the headline is the best it could be, because I doubt many people identify with a struggle to be more heroic. You might agree, once you read it, but it’s probably not a thought you ever had before you came across this headline. If we can find something that makes people nod their head and think “yes, exactly…” when they read it, that will be a more effective headline. This is probably still far from an ideal headline, but I chose it because this is a kind of wording that I have encountered when people talk about being unhappy with the way their lives are going. “Fed up” and “rat race” are both phrases that I’ve essentially copy-pasted from real conversations. Dean, the owner of the blog, undoubtedly has much better insights into his market than I do and he can do the same thing (but better): have conversations with his target audience and “copy-paste” the language they use, for his opt-in form text. That’s the most effective shortcut I know, for writing highly relatable copy. I made the opt-in field and button much more prominent, to match the scale of the other elements. I created a graphic that stands out from the background and is much more eye-catching. This is the lead generation form shown at the top of the homepage, on Tomas Michaud’s Guitar website. As you can see, this is a nicely put together form and it gets many elements right. That makes it a lot more difficult for me to suggest improvements… and there are some good lessons in that, as well. Leading the headline with the main benefit and putting the feature in the sub-heading, instead of the other way around. 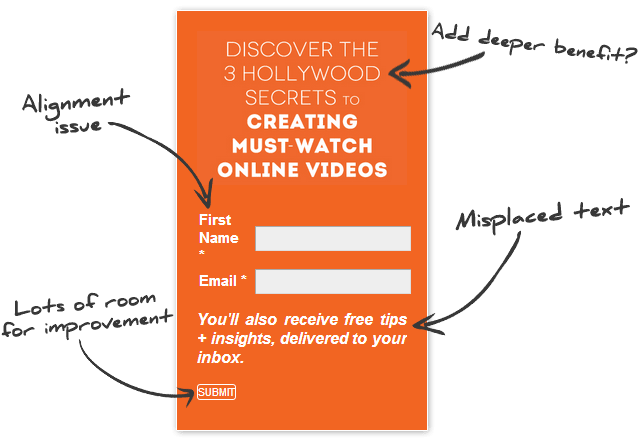 Adding a call-to-action arrow that leads the eye to the opt-in form. Making the content more easily consumable by reducing bullet points and adding a new “block” (testimonial). 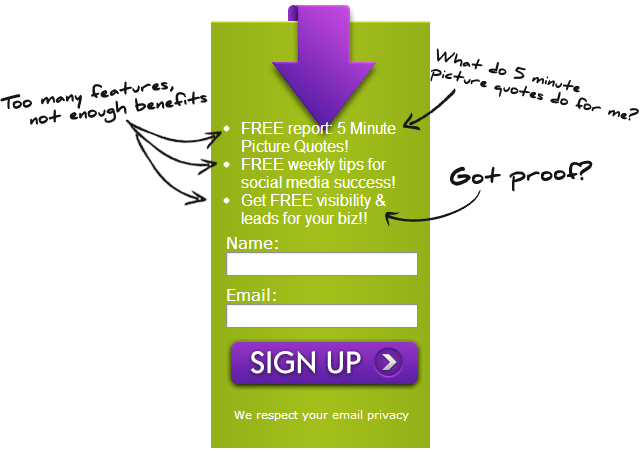 Adding social proof via a testimonial. These changes may lead to better conversion of the small above-the-fold area… but that’s not necessarily where conversions need to happen. I was happy to see that Tomas has a dedicated homepage, instead of just showing the latest blog posts (something I’ve been advocating against for some time now). Given that the entire homepage can be used to get the conversion, the opt-in form doesn’t necessarily have to be above the fold. Here’s an example of how moving the form further down led to increased conversions. As the article correctly states, it is not a case of always having to have the call to action above or below the fold. It’s a question of finding out which works best, in each individual case. For Tomas’ site, I would recommend the following test: remove the sidebar from the homepage, since it contains various calls to action that distract from purely getting the opt-in. Then, create a short and a longer version of a “mini sales page” for your free course. The short version should fit onto a large screen with no or very little scrolling. The long version should not be longer than about 2.5 screens. Run a test between the three versions: original, short page, long page and see which yields the best results. Let’s have a quick recap of the lessons we could learn from these examples. Headlines and Buttons are high-leverage elements and always worth optimizing and testing. Both your headline and your button should be bold and prominent. Don’t use lifeless imperatives on your button. “Submit” and “Confirm” are standard choices, but they rob you of the chance to add a much more lively and benefit-oriented button text. Not all benefits are made equal: look at a feature and ask “why do people want this?” and you’ll get a benefit. Then, ask “why do people want this benefit?” to reach a deeper, often more meaningful benefit. Nothing matters more than your offer: it’s always worth doing research to find out what your target audience really wants and testing several offers against each other. It’s better to offer one really cool incentive than to try and advertise multiple incentives in a small opt-in form. Tidy alignments and nice, clean graphics never hurt. Invest a few Dollars to hire someone for design work, if necessary. Don’t be afraid to think outside the (opt-in) box. 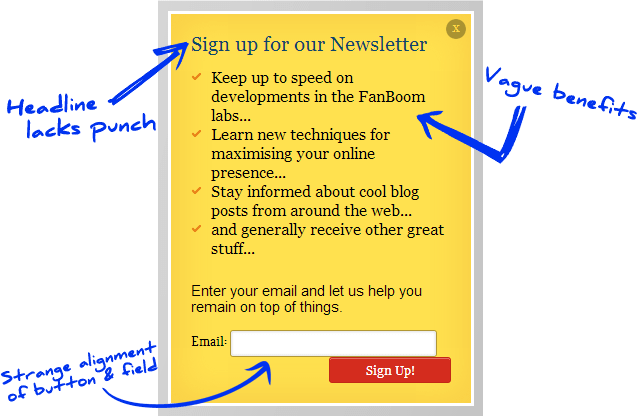 Ditch the box and try a completely different opt-in form type. Move the box to a different location. Radical changes can reward you with the greatest conversion wins. Those are some of the key lessons, but there’s much more in the examples above. If you just skipped down to this part: go back and read the examples. It’s worth it for everything you’ll learn about building a better mailing list. In this second opt-in form clinic, we went quite a bit deeper and I hope you can glean valuable lessons from all the examples. The most important thing is that you go and test some of this yourself, though. Even a small change, made today, can pay off in a big way later on. What was your favorite take away from this post? Leave a comment below and let me know! Thanks for this thorough analysis of examples, Shane. There are so many elements to creating a successful site and I appreciate your expert insight. Superb article, as always. Really enjoying the nerdy details in here. The more details the better, thank you! I run an art site and would love any suggestions on a good incentive magnet. I don’t teach/sell courses. I sell physical products. Any ideas? That’s an interesting question. What I’d think about here is: is there something you can help your prospects with, via written content? Are there problems you can help them solve or is there useful and interesting knowledge you can pass on to them, that is closely related to what you sell? You could also try a story angle: are the fascinating stories you can tell, related to art or artists? Something that could help you build an audience and keep people coming back, to become future customers? Your articles are awesome Shane, very meaningful. It’s a shame that Thrive doesn’t provide a platform where clients like me(very busy running the actual business) can’t network and hire Thrive Specialists who follow your instructions and can implement these strategies for clients. 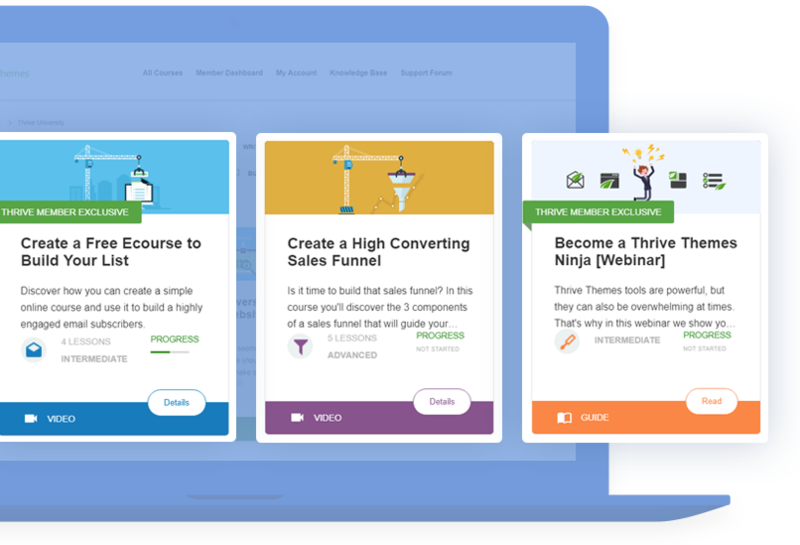 I’ve tried freelance resources like UpWork and Fiverr….but they DON’T really get it…You should..like MailChimp experts – which is where I found Thrive Leads in the first place! Thanks for the suggestion. This is actually something we are working on right now. Perfect…will you be advising current members when this becomes available?